NOTE that the English & French translations of my Ode to the Archangel Michael appear in the next post. Have you ever wondered what Mycenaean Linear B poetry would have sounded like? I know I have, many times over. 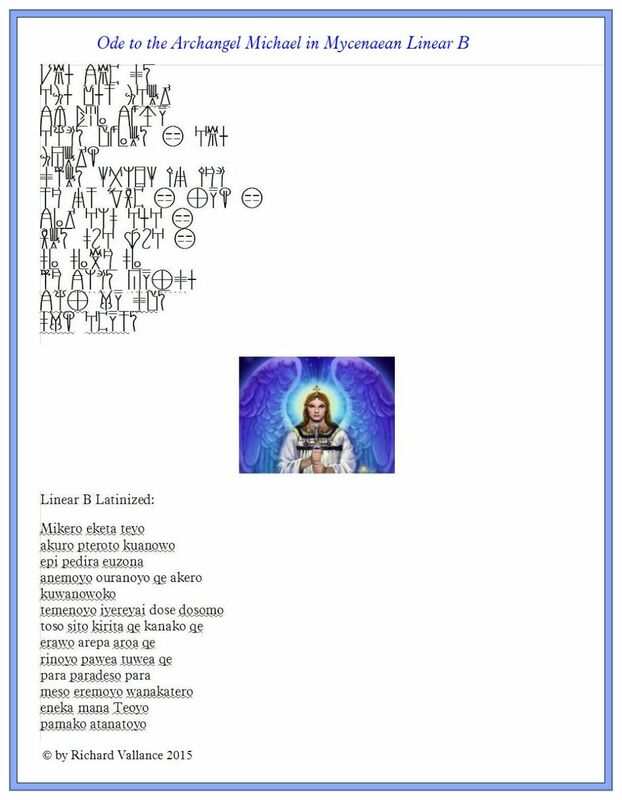 I invite you to simply read aloud the Latinized version of the Ode in Mycenaean Linear B, even if you do not understand it. The point is to enjoy the music of the poetry, not to worry about your pronunciation or your accent. Nobody really knows how any ancient Greek dialect sounded anyway. Here a few hints on how to bring out the music in the Mycenaean Greek. 1. Whenever you see the ending, oyo (genitive singular), pronounce it like “oiyo”, but in a single breath. It will sing that way. 2. If you put a little stress on the second-last syllable (penultimate) of words such as “peDIra ”“euZOno” “doSOmo” & “paraDEso”, this will also assist the melody of the poem. 3. Be sure to pronounce all “u”s & “eu”s (euzono) as you would “u” in French, if you can. 4. The disposition of the phrase “para paradeso para meso”  is very peculiar for Greek poetry... “meso ” should be on the same line as the previous words. But I did this deliberately, again for melodic reason. If you read this phrase like this, “PAra paraDEso PAra MEso”, it should sound very nice. 5. The word “mana” (“manna” in English) is obviously not Mycenaean, and not even Greek. It is Hebrew. But I could take liberties introducing this word into a Christian poem. So I did. So long as you are consistent and satisfied with how it sounds to you, that is all you need. Yes, and do read it aloud. Otherwise, you will not benefit from hearing the music and the harmony of the Mycenaean Greek, which is after all the earliest of the ancient East Greek dialects, the great-great-grandfather of dialects such as the Ionic & Attic. Besides, you can always allow yourself the pleasure of admiring the pretty Linear B script, however weird it may look to you at first. Just give it a chance. Being a poet of sorts myself, I decided to write this lyric ode, somewhat along the lines of Sappho (although I cannot even remotely claim a foothold on her astonishing lyrical powers!) It is by no means inconceivable that poetry may very well have been composed in the Mycenaean era, ca. 1450 – 1200 BCE. Simply because we do not have any evidence at all of such activity does not mean that the Minoan/Mycenaean scribes never wrote any poetry at all. The problem lies not with the non-survival of any Mycenaean poetry, but with the impossibility of conserving anything written on papyrus in a humid environment, such as that of Minoan Crete and of Mycenae. It is indeed fortunate, fortuitous and a great asset to us today that so many Egyptian papyri have been preserved intact since a distant period equal to that of the Mycenaean civilization at its apogee. Call it what you like, the extremely arid sand of Egypt was far far more favourable to the survival of ancient papyrus than the moist climate of Mycenaean Crete and the Mycenaean mainland. That is the real reason why we have no extant literature from their great civilization. But given the astonishing levels their civilization reached in so many areas, in art, architecture, fresco painting, the textile industry, crafts of all kinds, international commerce and even science, it strikes me as passingly strange that no literature of any kind survives, apart from the thousands of Linear B inventory, accounting and ritual tablets, which can hardly be called literature in any sense of the word. There are those who contend that in fact the Catalogue of Ships in Book II of the Iliad was derived from an earlier Mycenaean epic poem, no doubt in a much simpler and more earthy guise, stripped of much of the telling Homeric metaphorical language which is his hallmark even in the Catalogue of Ships. You can count me among these. For this reason, it strikes me as a distinct possibility that, if the Mycenaeans were able to tackle even a mini-epic poem, even if it were a much shorter, stripped down version of its descendant (if ever there was) of the Catalogue of Ships in the Iliad, they surely would have been up to the task of composing considerably shorter poems along the lines of this one you see posted here. Of course, they would never have written about angels and archangels. But that is beside the point. Simply by successfully composing this lyric poem, I believe I have demonstrated that such poetry was, at least conceivably, within the grasp of soi-disant Mycenaean bards. We shall never know, but it is well worth the speculation. I welcome comments on any aspect, as suggested above or otherwise, of my stab at composing a lyric poem in Mycenaean Linear B, Christian though it be. English and French versions to follow in the next post.